Today it rained. To be accurate it actually started yesterday evening, rained all night and continued all day. Not just a gentle shower, full tropical rain. And not your usual July weather in Central China. It rained so much that it was on the news. Bridges washed away, roads flooded, the lot. After yesterday's suffocating heat many of saw this as light relief and set off without waterproofs, the better to get the cooling effect. By lunchtime we were wet and starting to feel chilly. By lunchtime (a lovely KFC!) we had cracked the day and only had 150km to go. And that's when China threw one more challenge at us. Floods. The first one was 400m wide and 50cm deep. Cars were stopped in the deep parts but the trucks were getting through, so in we went. Three bikes didn't make it and were pushed to dry land. Out came the plug spanners and WD40 and soon we were moving again. The second flood was harder. The road surface was broken beneath the waves and finding a passable route was difficult. Some went left, some right. Nigel tried the edge and found the drainage ditch (see photo). 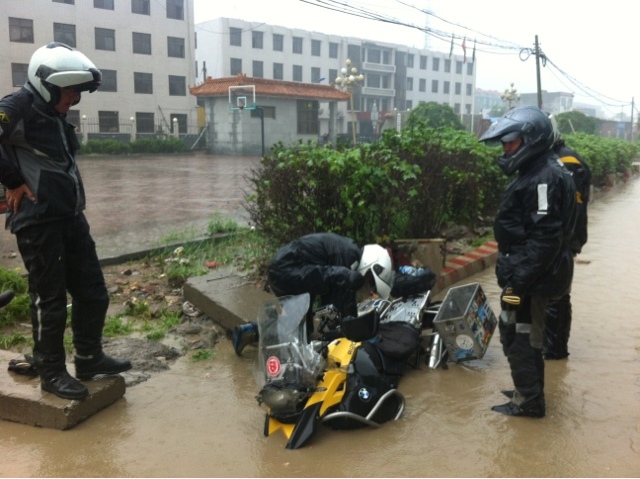 When we dragged his bike out it wasn't flooded and started at the first attempt. Quick thinking by Nigel, to turn the engine off as it went in, had saved the day. The third flood caught two of us out. The wake of the big lorries was so high it was higher than the exhaust pipe and flooded the engines. By now the fix - remove spark plugs, turn it over, spray with WD40, reassemble and fire up - was routine and we were soon back on the road. Our quick afternoon ride had become a dramatic hurdle and we rolled in at 19:00 to a very welcome beer and a good hotel room to dry out our kit. Tomorrow is our last 150km to Beijing. What more can we expect? Plagues of locusts or Godzilla. Proves that it was an adventure after all, even on tarmac roads.....well done.